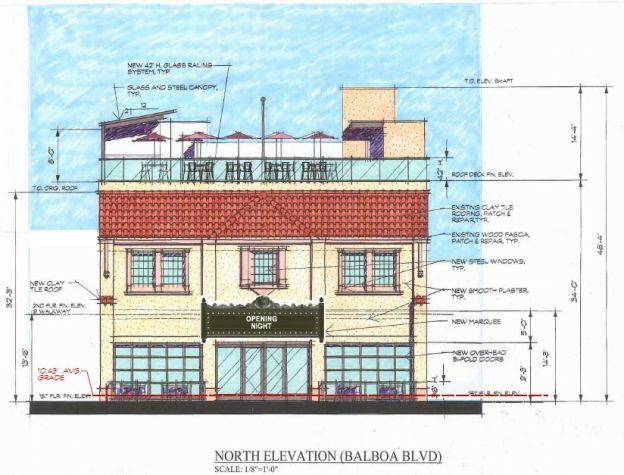 Project Overview: An application is being processed for the renovation of the Balboa Theater building (at 707 E. Balboa Blvd) by a private developer. Plans include adding a cafe (with full liquor service) and a rooftop dining area. In addition, since the site has long been vacant and has no parking of its own, the re-emergence of this building as a 285-seat/312 person entertainment center raises potential conflicts with summertime parking in the nearby Balboa Pier lot. Processing of this application is currently “off calendar,” with City staff now claiming that based on prior approvals, no public review or approval is necessary — even though the current project differs substantially from what was previously approved and the Coastal Commission has since found any development over 35′ on the Peninsula inconsistent with the CIty’s Coastal Land Use Plan. Coastal Commission staff initially disagreed saying the 2011 Coastal Development Permit (for an arguably even larger expansion extending to 55 feet) expired in 2013. City staff claims to have convinced Coastal staff that certain building permits taken out years ago make the 2011 CDP still effective. Despite these claims, it is not yet clear Coastal staff agrees. February 5, 2018: At a community forum at Marina Park, Community Development Director Seimone Jurjis announced City staff had determined the prior “entitlements” approved in 2004 (City Planning Commission Use Permit 1646) and 2011 (Coastal Commission CDP No. 5-11-073, preceded by CDP No. 5-05-235 in 2007) were still effective, so no further review was necessary. The new development needed nothing more to proceed, he said, than getting building permits. January 18, 2018: The application for this project first appeared as Item 5 on the Planning Commission’s January 18 agenda. Apparently as a result of public comments questioning the handling of the coastal development issues, City staff announced the item “needed more work” and should be taken “off calendar.” No further explanation was provided. This entry was posted in News, Watch List and tagged Balboa Theater, Coastal Development Permit, height limits, local coastal program on November 1, 2017 by Jim Mosher.